The Mid-Atlantic region has a stunning display of spring flowering native shrubs, filling the Preserve and surrounding natural areas with color and fragrance every spring. Join Naturalist Mary Anne Borge to learn about our native shrubs, their wildlife value and landscape beauty. 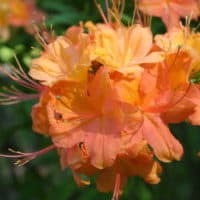 We’ll pay particular attention to the azaleas, dogwoods, viburnums, and some rose family members. The indoor presentation and discussion will be followed by an outdoor tour.